Enthusiastic Artist: PIXIOZE - a new tangle! PIXIOZE - a new tangle! Pixioze is quite simple, and develops in an organic way rather than more rigidly. As you can see, it uses a lot of Auras. Something about the tiny pattern and the sparkly look of all the tiny circles struck me as pixie-like, and there are a lot of larger circles, thus the name... pixie O's. It was inspired by a delightful design on a hotel carpet. I suggest placing the initial tiny circles very randomly, some close together, some far apart. Then three rings around each one. Add more tiny circles and Auras, and the occasional leaf shape with inner Auras. Keep adding circles and leaves until you've used all the space. Don't forget to shade at the end! Some of the background circles can spread quite wide. 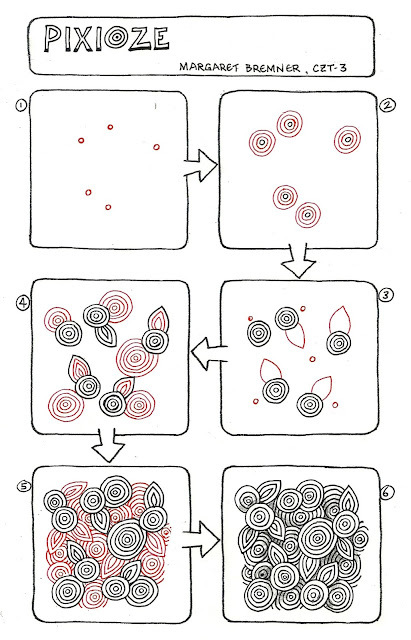 Some of the additional tiny circles can touch another shape, giving you more like half a 'target'. Some of the tiny circles could be dots instead (see the carpet photo), but I prefer them empty. More sparkly. BTW: It's getting harder and harder to keep track of tangles and names. If this pattern has been presented elsewhere, or if the name has been used already, please let me know! After this tangle went public, Debra Castaldi, a CZT in Boston USA, tried some variations which are delightful. 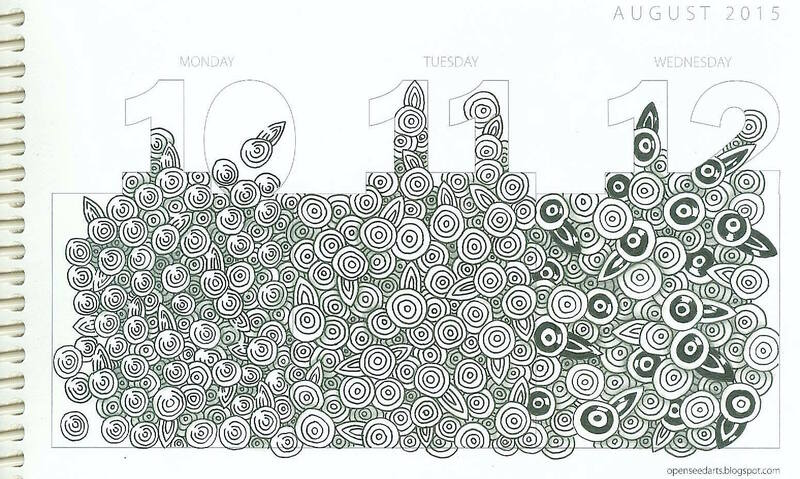 Here's her Tangle-a-Day calendar with Pixioze in the center, with broken line highlights on the left, and some blackened sections on the right. Have fun with those too! I love it! What a great fill *and* shape-delieator. Thank you. Great new tangle. It reminds me a bit of "Inaura" by Adele Bruno. I will have to try it out immediately! I love Pixoze! I like the depth you can get with shading. Very true Michele. While I'd always advise shading, some tangles really come more to life with it. OMG I love it. Will try it tonight. I love your tangles, Margaret. You always inspire me! Love this tangle. Very pretty and well done! I love this tangle. Can't wait to work with it. Thanks so much. Another great tangle! Will be trying it soon. I agree completely Jakki. I figure, if it can be drawn without a grid (and it should be thus) then it should be presented without a grid. I don't save anything presented on graph paper. Totally not Zentangle. I agree with Jakki as well. I love the simplicity of this pattern. It's definitely going into my list of "go-to-tangles." Margaret ~ I love this tangle: a great mix of organic and 'consistent fill', if that makes sense! I can't wait to play with it! It makes complete sense Holly! Love it! Can't wait to try it. It looks very versatile. I like this tangle...especially the name! It is similar to my tangle pattern 'Inaura' but yet quite different. I look forward to adding it to my tangle pattern 'library' and, thanks Margaret, you always inspire!!! Thanks! I checked out Inaura (didn't know it before) when someone else mentioned it. As you said, similar, but quite different. I love Jakki's comment above about tangles in general and what makes one worth of saving. 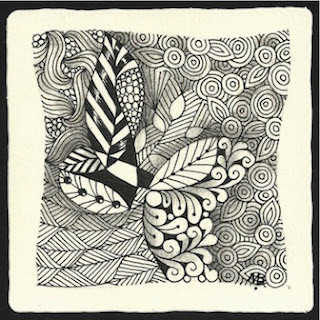 I read recently in one of the newer how to books on Zentangle that collection tangles has become a kind of "sub hobby" of some folks. You can really carried away with that. I agree. I sort of went that route for awhile. Now I am VERY picky about the ones that go into my "mac and cheese" list. I will be adding this one. It's a delightful winner. I'm with you there. 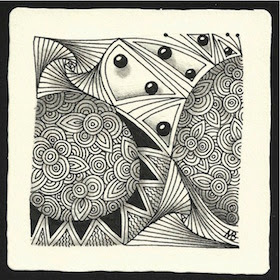 I expect most people, in the excitement of discovering Zentangle, become tangle collectors for a while. I know I did. I still save patterns that look interesting to try sometime, and I will, but there are simply too many. We all end up with favorites, even if there are 50 or 60 of them! I have the uncomfortable feeling, too, that inventing tangles becomes a 'thing' for some people, and they publicize too prolifically. This is a great pattern to use as a fill and you can create such 3D effect. Can't wait to try it. Your work always inspires me. Margaret! I love your new tangle and I saw it twice before I knew it was yours. I had to ask for the name and now I will use it lots because of the depth you can get with the shading and how whimsical it is. Great job, again... thanks for sharing! This is a very nice space filler, but I have to preach a bit. 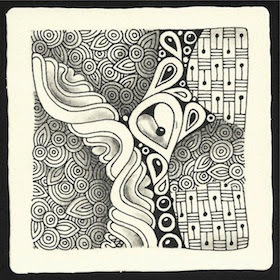 The idea of drawing something behind an element existed long before the "zentangle" term and method and is a recognized way of building up a painting. It's especially useful in abstract work (zen-type drawing is also mainly abstract) and I think anyone who "doodles" knows that drawing elements behind elements is one of the ways of constructing a drawing. Look at Peter Dranitsin's work on YouTube to see what I mean. Yes, of course, Faith. Artists have known about and used 'drawing behind' for possibly centuries (although not forever). 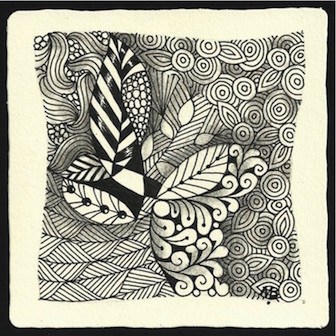 Zentangle simply gives it a name, shows how to do it in a simple way, and brings it to the attention of all those who have been told they can't draw and they aren't artists and don't bother. As an artist myself, it's nothing new to me, but I've had people in classes who, when I teach Hollibaugh for example, pause and say, "Ohhhhh" - a lightbulb goes on and they can see it's possibilities in other situations. It's a lovely tangle, I've just filled a page in my calendar exploring some variations.